Along with shorts, swimsuits, and sandals, casual dresses are a summertime staple around the globe. And we don't know about you, but the plethora of casual dresses to choose from this time of year can get more than a little overwhelming. So to help guide you in your shopping journey, we consulted the experts in all things trend-related: Edited. The fashion retail analytics company gets its insights by monitoring over 700 million products in real time. Luckily, Edited's retail analysis and insights director, Katie Smith, told us about six dress trends that are soaring in sales this season, and they're all really good. 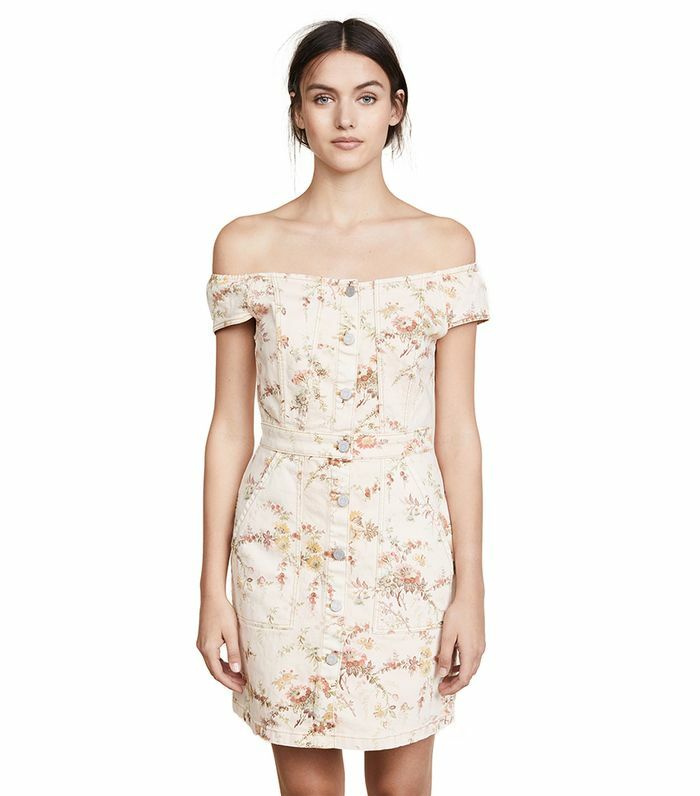 You'll have to keep reading to find out what they are, but we'll kick things off by providing you with this interesting tidbit from her: "Despite the chatter, the off-the-shoulder trend is far from dead." "Still proving very popular! Since March 1, 2018, there has been a 40.6% increase in new arrivals compared to the same point in the summer 2017 season. Sellouts have lifted too—there has been a 34.6% increase." "43% increase in new arrivals and 55% increase in sellouts." "This one is a progression of last year's button-down skirt [trend]. 28% increase in new arrivals and 66% increase in sellouts. In best sellers, there's a 50/50 split on patterned and plain styles, and the majority of prints are florals." "This one could have been influenced by Meghan [Markle's] wedding dress switch, as sellouts have lifted 35%, even though there was a 6% decrease in new arrivals." "Bigger news this summer than usual—especially relevant, as it's more sustainable. There has been a 13% increase in new products this season and a 45% increase in sellouts. After neutrals, pale pink is the best performing trend color." Available in sizes 12W to 20W. "This one is the biggie—there has been a 65% increase in new arrivals and a huge 111% increase in sellouts this season. The luxury market, which accounted for 31% of this season's new arrivals, is driving the trend with its high-end kudos." Next up are eight shoes to wear with dresses that aren't heels.